I’ve been absorbed by arcade racing games since I was about 11 years old. Every year I went to the seaside with my Mum and Dad and I literally could talk about arcade machines for hours, days, years (and have in fact done so). I’ve written the series in the order that I remember discovering the machines so there will be some chronological inconsistencies where I suddenly return to a really old game. I think I was drawn to driving games because the cabinets always stood out clearly. They had big steering wheels on the front of them rather than just an assortment of buttons. But they often had something else. They had cockpits. Wooden enclosures that surrounded the screen. You could climb inside and sit down on the seat. It was the closest thing you could get to actually sitting inside a racing car. 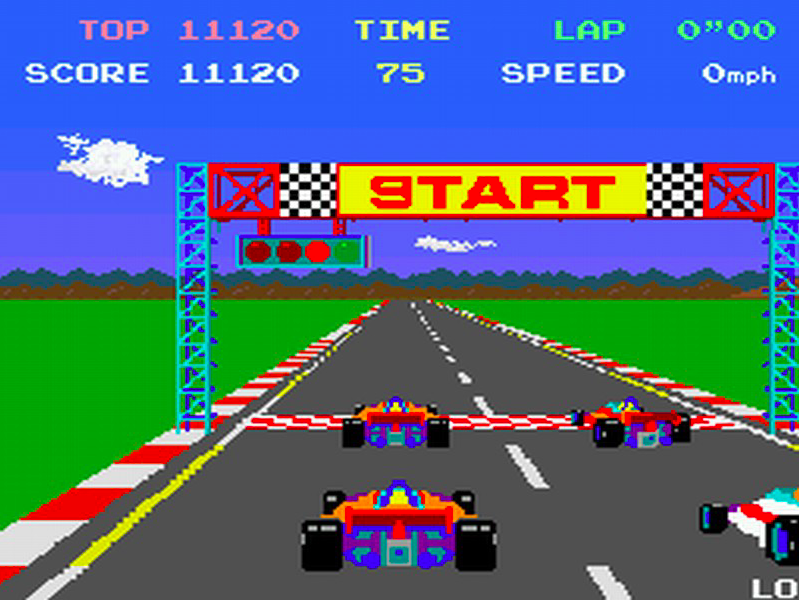 The coin-op version of “Pole Position” always stood out. The iconic attract mode (the sequence that plays to attract you towards it) featured a loud beeping countdown sequence. That was usually enough to make two ten pence coins start to warm up in my pocket. The machine also had speech. And that was a big deal back in the early 1980’s. Only a small handful of games had speech. (“Wizard of World” or “Gorf!” but those were incredibly rare in UK arcades.) The 3D effect was very fast and smooth, the car exploded when you stacked it into a billboard, and I think the colours used on the player car made it all really appealing to me. In fact, thirty five years later, I still think it’s one of the nicest player cars in any game ever! To be good at “Pole Position” you needed deep pockets. The machines were nearly always set to Hard by the people who owned the arcades, and two crashes pretty much stopped your chances of being able to put a score on the High Score table. I don’t think I ever met anyone, anywhere, who was really good at it. Plus, the steering wheels were often busted or felt really vague whilst playing. That was due to an untold number of very young children coming up to each machine and either pretending to play during the attract mode, or worse still, violently spinning the wheel around and around! Even if your luck was in and you found a machine set to Easy or Normal, and the wheel worked properly, you could ‘deposit’ a coin, hear the starting fanfare, watch the scrolling blimp pass over the Start Line and hear the incredible (but slightly muffled “Prepare to Qualify” and then discover that the accelerator pedal was busted! Leaving you sitting there unable to do anything but turn the wheel and watch the game Timer count down to “Game Over” and feel like a total fool. “Pole Position” was a bit like having a 1980’s long distance love affair. Something best left at the arcades. Not to try and bring home with you. No matter what anyone might tell you, there was never a good home version of the game. Definitely not on Vic-20, Commodore 64, or Spectrum. I played them all. The official versions never quite cut the mustard, but usually seduced us with a dazzling box artwork featuring that cool logo. And the wheels on the car were always square blocks. The game could never feel the same using a joystick. Years later, I remember the delight of finding a job lot of Atari 7800 consoles in a discount warehouse in 1991. I eagerly bought one and a copy of the game, which was titled “Pole Position II” I’d read (via Jeff Minter’s brilliant newsletter) that this gem of a machine had the definitive home version of the game. I raced home and fired it up only to discover that yes, this version was rubbish too. My beloved blue, red, orange and purple car was a plain orange in this version. It’s a game that I’d still happily play to this day. Especially if it was an original sit down machine (even featuring the metal sign on the roof so you can study the track whilst waiting for your turn!) with a working wheel, and hopefully a working pedal as well! I once read that when the Japanese engineers at Namco showed the game to the head of Atari for the first time in North America he found the 3D effect so convincing that he fell out of the cabinet on the first corner! It might be hard to understand today the impact that this game had back in 1983, but I think it’s the first driving game that had a big influence on me.